Tattoos are a way to express your individuality and are incredibly popular. Unfortunately, however, permanent body art does not always suit your aesthetic preferences over time. 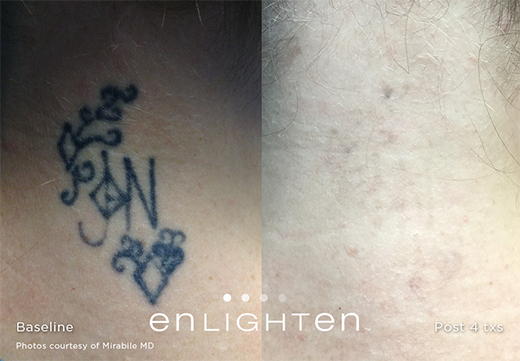 At Reflections Aesthetic & Laser Solutions, tattoo removal offers a chance to erase a fading or unwanted tattoo. To learn more, schedule an appointment by calling the Vero Beach, Florida, office or using the fast and easy online scheduling tool. When you get a tattoo, the process involves using one or more mechanized needles to rapidly puncture your skin and deliver ink deep into the second layer, or dermis, of your skin. Because the process damages your skin, your body's immune system is triggered. Your body sends white blood cells to the site of the tattoo. Those cells try to absorb the foreign particles and filter them through your bloodstream, eventually flushing them from your body. However, the pigment particles in tattoo ink are too large for your white blood cells to remove, so they remain in your dermis layer, visible through your epidermis. 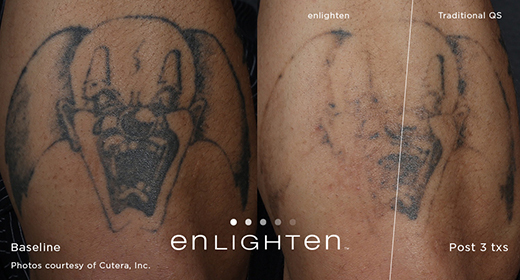 At Reflections Aesthetic & Laser Solutions, laser tattoo removal is completed using the CUTERA® enlighten™ laser system. This innovative device is effective for all skin tones and can target and remove all colors of tattoo ink. In years past, doctors thought some people just weren't good candidates for laser tattoo removal. Innovations in laser technology have created systems that can now provide effective tattoo removal services regardless of the color of your skin or the colors in your tattoo. During your initial consultation, your doctor will estimate the number of treatments necessary to thoroughly remove your tattoo. The process works by directing a highly concentrated beam of light to the treatment area. Multiple different laser wavelengths target all colors of ink, breaking up the pigment in the colors so that your body can efficiently remove those particles. During treatment, you will wear a pair of protective glasses. Your doctor at Reflections Aesthetic & Laser Solutions will test your skin's reaction to the laser to help calibrate the machine. The laser is then carefully guided over the surface of your tattoo. Small or light-colored tattoos are easily removable. Large, dark, or complicated body art may require multiple visits. What is the Proper Aftercare for Laser Tattoo Removal? After your laser tattoo removal appointment, your skin may be sensitive or slightly swollen. Cool compresses and over-the-counter pain relief medication are all that's needed to address minor discomfort. Your doctor at Reflections Aesthetic & Laser Solutions will apply cream and a bandage to protect the treatment area. Over the following days, keeping the area clean and following post-care instructions is essential. If you spend time outside, be sure to apply a broad-spectrum sunblock with a high SPF. When you're ready to say goodbye to old, faded, or no longer wanted tattoos, schedule a consultation with Reflections Aesthetic & Laser Solutions.